The declining fossil-based resources dominating our industry and their processing associated with environmental pollution and climate change are shifting attention towards bio-based renewable resources as alternative industrial raw material and the use of green technologies. Among these bio-based resources, lignin, a major by-product of the pulp and paper industry, is emerging as a possible raw material with potential to replace many fossil-based chemicals and materials. However, lignin is a highly heterogeneous complex material whose physico-chemical properties depend on the source of lignocellulose material (soft or hard wood), modifications introduced during the pulping process (sulphite, sulphate, solvent or soda) and other associated impurities arising from the pulping process. In addition, lignin is characterized by strong inter- and intra-hydrogen bonding, which makes lignin immiscible in polymer blends or lignin-based materials brittle. Lignin therefore requires processing to make it a suitable raw material. Several chemical, physical and biotechnological methods are being developed to make lignin suitable for the synthesis of a variety of different products. Oxidative enzyme-based methods, especially laccases and peroxidases, are emerging as the most promising efficient green biocatalysts. 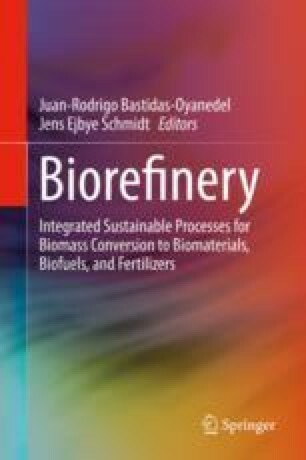 This chapter highlights advances in the development of enzyme-based processes for making lignin suitable for synthesizing lignin-based materials. Unlike previous general overviews, this chapter places special emphasis on changes that enzymes introduce in different types of lignin at molecular level and the properties of the modified lignin and potential application.